Yes, perhaps they take a little bit longer to get up, and they can�t walk quite as fast as they used to. Their eyes may be a little bit cloudy, and their faces are sprinkled with �powdered sugar�. Maybe their teeth are a little worn. 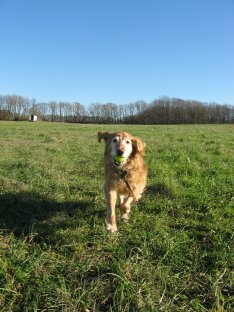 But anyone who has had the opportunity to share their lives with a senior Golden will tell you what a wonderful, special time it is. GRRI has a wonderful senior and one special needs dog waiting patiently in their foster homes for that perfect family to come and adopt them. �A lady never tells her true age� and that perfectly describes our Sadie. 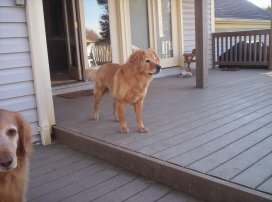 You�d never know this energetic female Golden is 9 years old. 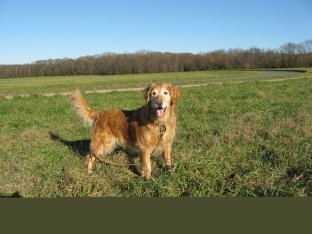 She loves to run in the fields and retrieve tennis balls at her foster mom�s farm. She has amazing mobility and performs acrobatic leaps and twists as she dashes for the ball. She immediately returns to drop it at your feet, waiting patiently for it to be thrown again. Her leash manners are impeccable as are her house manners. 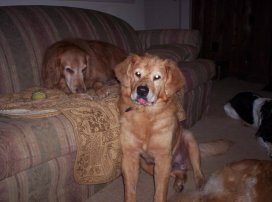 She doesn�t get on the furniture, knows basic obedience commands, and is very calm indoors. She makes a wonderful vacuum cleaner as well. If some kind of food item drops to the floor she will gladly eat it, but she won�t counter surf or steal food from the table. She did fess up to eating a vanilla-scented candle - who can resist the scent of vanilla? She loves people and is extremely affectionate to everyone she meets. So what�s the catch? Sadie MUST be the only pet in the household. She does not get along with other dogs. She has a strong predatory drive so she cannot go to a home with cats, birds or other small animals. If you have no other pets in your home, would you please consider Sadie? You�ve Come a Long Way Leo ! Leo made his public debut in our Summer 2006 issue. Since then, he�s been very busy playing, sleeping and enjoying life overall. His once sparse fur coat is now thick and luxurious; he�s becoming a little bit more confident when he meets new dogs, and he�s continuing to play with the resident dogs in his foster home. He�s been on short �sleepover vacations� while his foster dad went on vacation himself and did very well in strange surroundings. In the fall Leo was examined by a veterinary Cardiologist who diagnosed Leo with a condition called early degenerative valve disease. At this time he is not on any cardiac medication and we have been advised to continue with his current diet and exercise regime. He should be monitored regularly by a primary veterinarian as part of routine wellness exams, and should have a cardiac re-evaluation annually. We promised Leo that we would find him the perfect forever home. Is it yours?